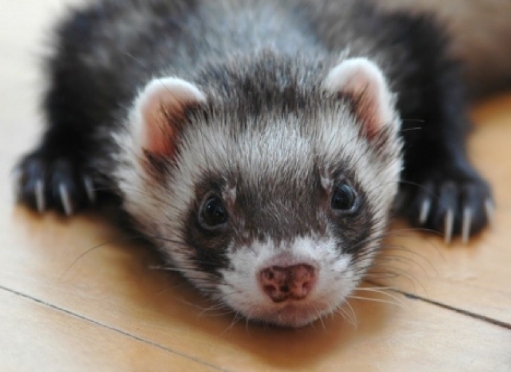 Celeste was a ferret...and one of my most important teachers. That summer, I had agreed to be the house-and-pet sitter for three weeks while my friend Kathy visited sacred sites in England. An animal-lover with a huge heart, Kathy filled her home with quite a variety of creatures including Oliver the golden retriever, Mellie the rabbit, Samantha the pigeon, an assortment of cockatiels, and several ferrets, the oldest of whom was Celeste. I also love animals and was looking forward to getting to know her furry-and-feathered family. Celeste's health is declining and needs hand feeding. Put some baby food on a paper plate, swipe your finger through it and let her lick your finger clean. Repeat until she turns her head away. What? Really?? Well, OK, I thought, as long as it doesn't take too long. You see, I had a morning schedule that I truly loved, and it supported my new-found spiritual awakening. First thing in the morning, I’d go for a walk around a lake in the woods. And since it was the same walk every morning, my challenge was to notice what had changed from the day before. What I noticed was that seasons change a day at a time when you're paying attention. Then I'd pick up a cup of coffee in town and drive down to the river to watch the boats, the birds and the breeze. Returning home, I'd shower and prepare my seat in front of my altar - the top of the air conditioner in my bedroom that I'd adorned with sacred found objects like shells, stones, acorns and feathers. Settling in, I'd put in a half an hour of meditating. Of course, with my house-sitting gig, my routine had already changed. While I did manage to get the walk in first thing, I'd race over to Kathy's to take care of everyone before I did anything else. Feeding Celeste by hand was going to seriously cut into my day. But there I was, holding the ferret and scooping up baby food carrots and squash, imploring this sick ferret to lick faster. Scoop, lick, lick, pause, rest, lick lick. Scoop again. "C'mon, Celeste," I'd urge silently. "I have to get home for my meditation!" Then, all at once, I got it. Here I was, holding this living, breathing creature, providing her nourishment in a way she could tolerate it, her soft, pink tongue taking in as much as she could manage at a time. This IS my meditation! In that moment, I understood the concept of Mindfulness in a way no explanation could provide. Celeste was my teacher.